This posting is about a charitable cause but more about how it relates to the networks we are part of, rather than a request for you to donate. Every day I open at least one email looking for sponsors. I don't mind and it is much easier than when I was younger, the embarrassment of approaching friends and colleagues. I try and give when the requester is a real friend and I like the cause. So when I opened the first email about wee Oscar it bought me to tears. 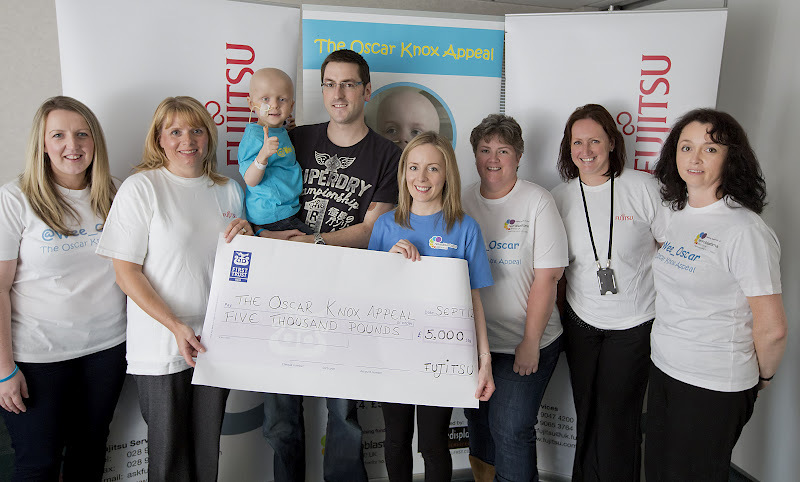 On its own it is a sad story but Wee Oscar is the little boy of Leona who is an Oracle developer with Fujitsu in Belfast ( and if you didn't know that is my official location as well)! Wee Oscar is just 4, and suffers from high risk Neuroblastoma for which the treatment needed costs £250,000 and is not currently available to them in the UK. So as any parents would they started the seemingly impossible task of raising money for his treatment. At first it seemed it would take forever, but he got a little local TV time and the folks of Norn Ireland took Oscar to their hearts. Then he hit the big time when some Dublin students with their don't tell angela flag became heros overnight and decided to auction their flag and share the proceeds between two charities, Wee Oscar being one of these. Leona's colleagues in Fujitsu baked cakes, held collections and did what they could. I asked Oracle Ireland if they could help and they had an ice cream drive at the Dublin campus. Things needed to step up as despite being so adorable Oscar is very unwell. Leona's manager Angela Woods, not known for her daredevil persona joined others abseiling down the Europa ( Europe's most bombed hotel) and another colleague the old mannered Nick Anderson, himself recently a father has agreed to box for Oscar. Unbelievably they have almost reached their target, but unfortunatly money alone is not the answer he is still a very sick little boy. It is sad when people need medical help and terrible when the people who love them have to find the money, but when it is someone you know it is so personal you want to help. What it shows is that people do care and that same network we use to help us understand and share our technical knowledge, is also a network of friends. I have experienced this network of friends who have reached out to me when I need emotional support and I hope I never need them like Wee Oscar does.